My parents divorced when I was just five years old and up until that point the world to me was pretty small. I knew the streets around my neighbour, my school was at the end of my road and the only time needed to get in a car was to go and visit my grandparents. With Bob keeping the house we moved to the other side of town and I took a bus to school each day with my sister. This in itself started to open up my world and slowly I began to realise that there was so much to see that just a little neighbourhood that I was used to. As I started high school, I began to dream about my future and how I wanted to join the armed forces in order to see the world. I joined both the air cadets and sea cadets (yes I was one of those teenagers) in order to prepare myself for life in the military. Over my teenage years, I was blessed to have met so many different people from all over the UK. Whilst I opted not to join up after college (I fell in love and wanted to stay close to home) I have kept in touch with all those friends I made, who now live across the globe. You see Freda would always be the one sitting on the grass making daisy chains whilst we were waiting for the next activity or just chilling out in the evenings. 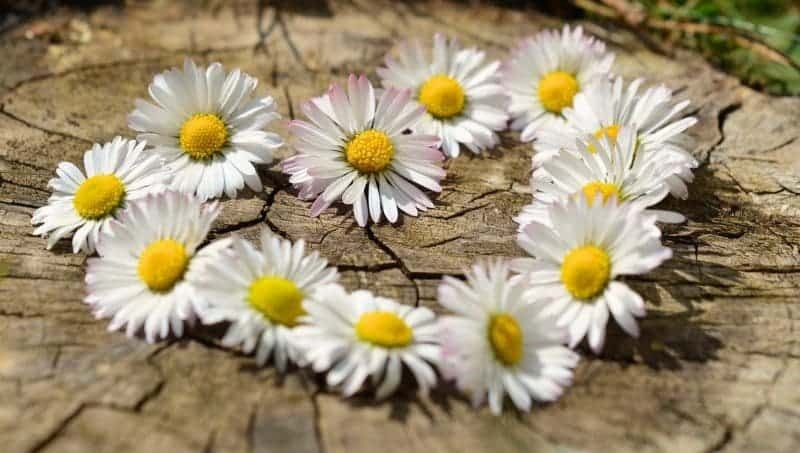 So a beautiful bouquet of daisies headed her way along with a copy of the photo from our teenage years of her sitting making her famous daisy chains. I’m not sure who I’m going to get this year but it’s like playing secret Santa with friends near and far in September.